Corrective jaw, or orthognathic, surgery is performed by Oral and Maxillofacial Surgeons to correct a wide range of minor and major skeletal and dental irregularities, including the misalignment of jaws and teeth, which, in turn, can improve chewing, speaking and breathing. While the patient's appearance may be dramatically enhanced as a result of their surgery, orthognathic surgery is performed to correct functional problems. People who may benefit from corrective jaw surgery include those with an improper bite resulting from misaligned teeth and/or jaws. In some cases, the upper and lower jaws may grow at different rates. 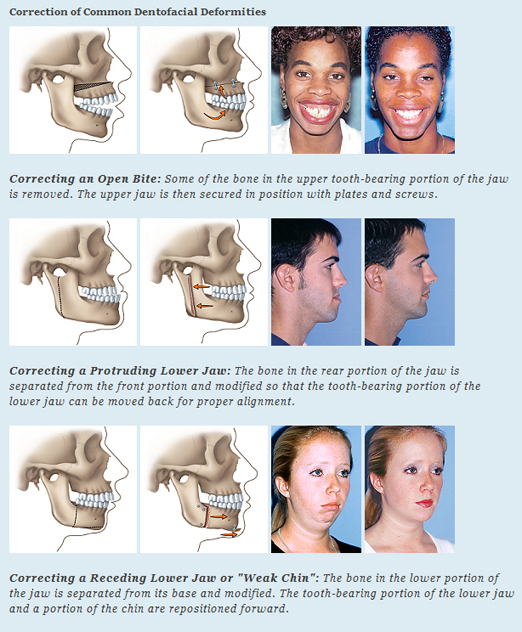 Injuries and birth defects may also affect jaw alignment. While orthodontics can usually correct bite, or "occlusion," problems when only the teeth are misaligned, corrective jaw surgery may be necessary to correct misalignment of the jaws. Your dentist, orthodontist and Oral and Maxillofacial Surgeon will work together to determine whether you are a candidate for corrective jaw, or orthognathic, surgery. The Oral and Maxillofacial Surgeon determines which corrective jaw surgical procedure is appropriate and performs the actual surgery. It is important to understand that your treatment, which will probably include orthodontics before and after surgery, may take several years to complete. Your Oral and Maxillofacial Surgeon and orthodontist understand that this is a long-term commitment for you and your family.They will try to realistically estimate the time required for your treatment. Corrective jaw surgery may reposition all or part of the upper jaw, lower jaw and chin. When you are fully informed about your case and your treatment options, you and your dental team will determine the course of treatment that is best for you. What Is Involved in Corrective Jaw Surgery? Before your surgery, orthodontic braces move the teeth into a new position. Because your teeth are being moved into a position that will fit together after surgery, you may at first think your bite is getting worse rather than better. When your Oral and Maxillofacial Surgeon repositions your jaws during surgery, however, your teeth should fit together properly. As your pre-surgical orthodontic treatment nears completion, additional or updated records, including x-rays, pictures and models of your teeth, may be taken to help guide your surgery. Depending on the procedure, corrective jaw surgery may be performed under general anesthesia in a hospital, an ambulatory surgical center or in the oral and maxillofacial surgery office. Surgery may take from one to several hours to complete. Your Oral and Maxillofacial Surgeon will reposition the jawbones in accordance with your specific needs. In some cases, bone may be added, taken away or reshaped. Surgical plates, screws, wires and rubber bands may be used to hold your jaws in their new positions. Incisions are usually made inside the mouth to reduce visible scarring; however, some cases do require small incisions outside of the mouth. When this is necessary, care is taken to minimize their appearance. After surgery, your surgeon will provide instructions for a modified diet, which may include solids and liquids, as well as a schedule for transitioning to a normal diet. You may also be asked to refrain from using tobacco products and avoid strenuous physical activity. Pain following corrective jaw surgery is easily controlled with medication and patients are generally able to return to work or school from one to three weeks after surgery, depending on how they are feeling. While the initial healing phase is about six weeks, complete healing of the jaws takes between nine and 12 months. Corrective jaw surgery moves your teeth and jaws into positions that are more balanced, functional and healthy. Although the goal of this surgery is to improve your bite and function, some patients also experience enhancements to their appearance and speech. The results of corrective jaw surgery can have a dramatic and positive effect on many aspects of your life. So make the most of the new you!